Mozete na ovom uređaju surfati na internetu i pratiti omiljene tv programe, zemaljske digitalne, satelitske i kablovske. Mozete gledati besplatno filmove i igrati igrice, sve na jednom mjestu. Ovaj TV Box se moze nadograđivati preko USB-a ili SD kartice. Pored ANDROID operativnog sistema moze se ugraditi i LINUX operativni sistem. •Network Function: Miracast, Airplay, Skype chatting, Picasa, Flicker, Online movies, etc. KIII Pro Octa-core Android TV Box is the new generation of multimedia player and home multimedia gateway which is the best way for you to enjoy network life. On-line video: many IPTV programs, all standard IPTV software and popular on-line video websites based on Android system. (such as, local satellite TVs, sports, finance, etc). It can also connect to your designated websites. Android applications: support many applications from Google play including web browser, Google map, 2D/3D games, P2P download, online video chat, email and so on. Support mouse and keyboard; support FAT16, FAT32, NTFS file system. 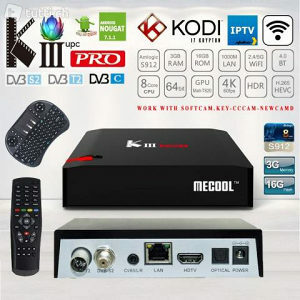 KIII Pro Octa-core Android TV Box supports high speed of Wi-Fi for network applications, it support 2.4GHz wireless mouse, keyboard and air remote; Full HD definition All formats with H.264/H265 high definition decoding, support all formats. The technology based on Android system in the box enables many applications including web browser, 2D/3D games, Skype/QQ internet video chat, office applications software and so on.